* This review may contain spoilers for the previous books in the Bloodlines series. To Sum It Up: Sydney’s worst nightmare has come true: she’s been taken to an Alchemist re-education center, where the Alchemists’ methods for reinforcing loyalty to the organization are every bit as horrible as she feared. Sydney’s prison even prevents Adrian from contacting her through dreams. With no apparent way out of the Alchemists’ grasp, not even Sydney’s formidable logic and resourcefulness may be enough to help her escape. Review: Although I enjoyed reading The Fiery Heart, I couldn’t help feeling that it just didn’t quite have the same spark as the other Bloodlines novels. Silver Shadows, on the other hand, was absolutely awesome. I devoured it in a little over a day, completely absorbed by poor Sydney’s imprisonment by the Alchemists and both her and Adrian’s attempts to break her out of there. Sydney is incredible in this book. She’s always been skilled at using logic to escape tough situations, but Alchemist re-education is unlike anything she’s previously gone up against. It’s hell. Re-education has been alluded to in the previous books as something to be avoided at all costs, but it’s another thing entirely to watch Sydney endure physical and psychological torment at the Alchemists’ hands, all in the name of “cleansing” her sin. The Alchemists preach about the evils of vampires, but they’re perfectly fine with breaking their own people. Even under these conditions, though, Sydney continues to fight. The other detainees in the re-education facility are wary of her because they don’t want association with someone so tainted to delay their own release. Still, Sydney manages to muster a few tenuous alliances in a place where anyone could betray her at any time. Adrian, meanwhile, is totally falling apart in Sydney’s absence. His spiral into self-destruction is heartbreaking. He’s never felt like more of a failure because he’s unable to find a single clue to Sydney’s whereabouts, even through dreams. Adrian’s struggles may be of a different nature than Sydney’s, but his pain is very much as searing as hers is. The tension build-up in Silver Shadows is superb. There’s barely a lull in the novel, especially in Sydney’s chapters. Her mind is always at work to undermine her captors, all while she tries to convince them that rehabilitation is working. It takes Adrian a while to find his way, but when he does . . . he’s simply amazing. I didn’t think it was possible to love him more than I already did, but by the end of this book, I’d found tons more love for him. I can’t forget to mention how much I loved Adrian and Sydney’s extended family, too: Jill, Eddie, Angeline, Trey, new-ish guy Neil, Ms. Terwilliger, and, of course, little Hopper. They’d do anything for each other, and that’s truly on display here. Heck, this book even gave me a newfound respect for rebel Alchemist Marcus Finch. Richelle Mead is brilliant at dropping bombshell endings, and this one . . . . Let’s just say that I wish I could fast forward time to the release date for the next book. All in All: Silver Shadows blew me away. The dual POVs suited it perfectly, and it just threw twist after twist at you. Wow, 5 stars! That's great news! At least this series is still going strong. I really enjoyed this one as well. great story and no plot holes to drive you nuts. I can't wait for the next one. Matt @ JC's Book Haven. Same here! I wasn't as crazy about The Fiery Heart and was a little worried when I started Silver Shadows, but it totally blew me away. I've kind of slowly given up on this series. I don't know what it is but somewhere along the magic made me lose interest. I guess I'm still a little hungover because of Rose Hathaway, the girl is hard to beat. I'm not sure if I will pick this one up but I have become intrigued by the re-education plot, I think it could lead to some fun things. Thanks for your review. It took a while for Sydney to grow on me as a main character, especially because I loved Rose so much, but I really do like Sydney now. 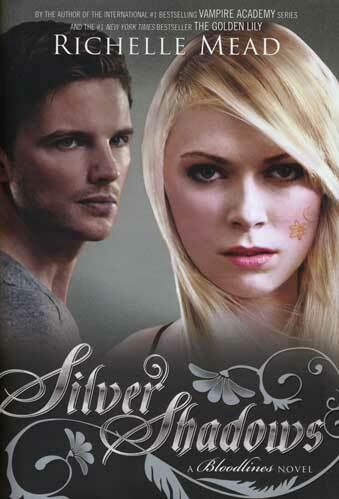 I felt like the series lost a little momentum with the previous book, The Fiery Heart, but Silver Shadows more than made up for it.